Click the Membership Dues Schedule tab. This is where we set the recurring prices for everything. Let’s again consider our example scenario. Note how the Standard Dues Schedule tab reflects the first three bullet points (no need to incorporate the Locations since the pricing is the same and we are not tracking income for each separately). 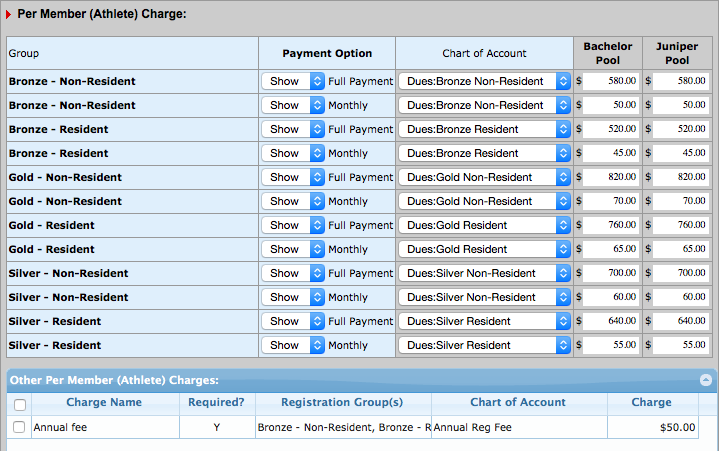 Billing Groups appear in turquoise. Hover over Sub Billing Groups to see the billing frequency for each. An athlete can only be in ONE Billing Group and Sub Billing Group. Therefore you would not put both monthly dues and an annual fee in the Standard Dues Schedule. See other tabs for additional charges. The Billing system picks the most expensive price for each athlete at each level, and it calculates this based on the yearly total for each one. Suppose you have three athletes, one in each of the Gold, Silver, and Bronze groups and each belongs to the “Monthly - Resident” Sub Billing Group. Gold is the most expensive first athlete, so it would charge $65. It then moves to the second column and charges $55 for the second athlete in the Silver Group. That leaves $45 for the last athlete in the Bronze Group. If two athletes are in two different groups and both cost the same, each time it will randomly pick which athlete to charge first. Keep registration in mind as you set up. Only charge a fee in one place to avoid double billing. For example, do not charge a $50 annual fee in both registration and billing. We will collect it during Registration in our example, so we will not enter it in the Additional Per Account Charge tab. 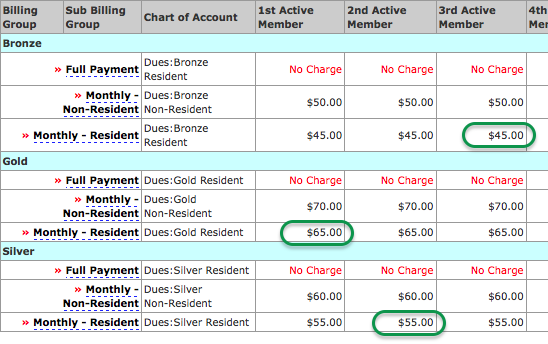 The Full Payment Sub Billing Group is $0 because in our example we chose to have families pay that when they register. You could choose to put the full payment amount here instead. Obviously, you need to do that if you don’t use our Online Registration system. Before we get into the mechanics, we also want to show you how our scenario looks in Online Registration so you can understand how the two work together. Parents can choose all of the options listed above, so we set up the following Reg. Groups. We named them the same as our Billing Groups and Roster Groups, though you are not required to do so. Note that if we wanted to track the income for each location separately, we would need to create different Reg. Groups for each since you can only have one CoA per row. Here we match the payment frequencies defined in the Sub Billing Groups. To reduce confusion, TeamUnify recommends naming your Payments Options the same as your Sub Billing Groups when possible. The first page of Reg. Fees Setup looks like this. The multi-athlete discount is at the bottom of the Fees Setup page. Note it only takes a discount from one cell based on the number of athletes. Since we take $10 off the second athlete and $20 off the third, we put $30 in the discount for three athletes (10 + 20). Hopefully, this high-level view has helped you understand how Billing and Registration tie together. 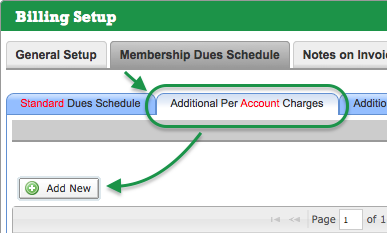 Now we’ll cover how to enter fees in each section of the Membership Dues Schedule. 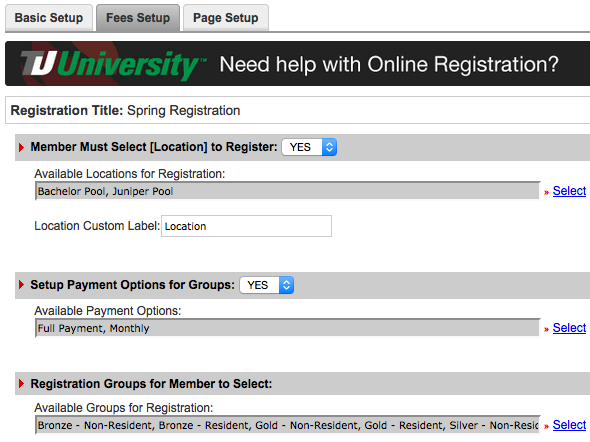 You can skip to step 3 if you’re already on the Standard Dues Schedule tab. Click Edit Standard Dues Schedule. Multi-Athlete Discount — Use this if you want to automatically calculate and give a uniform percentage discount to some or all of your Groups. This allows you to match a percentage multi-athlete discount set in Registration if you like. 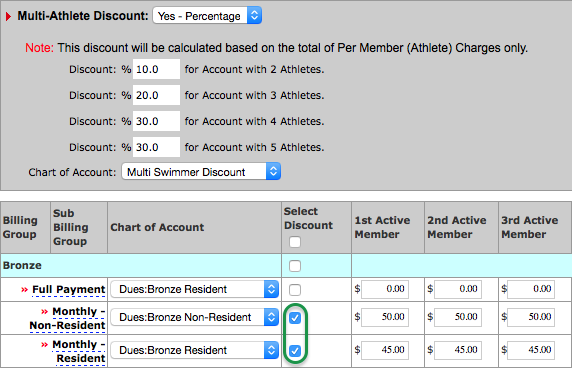 Set the “Multi-Athlete Discount” drop down to Yes - Percentage. 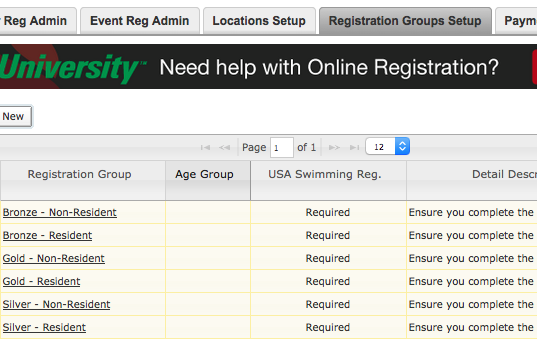 Enter discounts based on the number of athletes registering. Do NOT add them together. Three athletes gives a 20% discount, NOT 30% (10 + 20). Note that each number is a percentage off of the TOTAL. Using the same example, if three athletes cost $50 each, the system will give 20% off of $150, which is $30, and thus charge $120. Check the box in rows to which you want to apply the discount. Checking a box in a Billing Group row will automatically check the boxes for all the Sub Billing Groups within it. Where each percentage says “for Account with X Athletes” this implies “in selected rows.” If a family has two athletes and one athlete belongs to a Sub Billing Group in a selected row and another doesn’t, they will not get the multi-athlete discount because only one is in a Sub Billing Group with a multi-athlete percentage discount selected. Select a Chart of Account for each Sub Billing Group that needs one. You MUST do this for every CoA you have not set yet or else you will NOT be able to save your changes. Enter prices for each row that needs them. If you will collect the fee in Registration, leave the price as $0. Enter prices all the way out to the 5th member, even if you think you’ll never get a family that big. You just might someday, and then those 4th and 5th members you left at $0 will get in for free! If you checked the “Select Discount” checkbox to apply the Multi-Athlete Discount to a row, you will typically enter the same price for the 1st through 5th Active Members since the percentages you enter in the Multi-Athlete Discount you entered will take care of the discount. Otherwise enter the price to charge each member, with at least the 1st member at full price. Make sure to save once in a while if you have a lot of changes, lest you get logged out and lose your work. Again, make sure to select all CoAs. Any charge entered here is generated once for a given account, regardless of how many members are in it. Fees entered here apply to families with at least one active member who is not in a free billing group. There is no way to apply fees to only certain Billing or Sub Billing or Roster Groups; they apply to ALL active accounts as described in the previous point. Remember that if you charge a certain per account fee in Registration, do NOT charge it here as well, and vice versa. Here is how to add a per account charge. If you just completed the Standard Dues Schedule, skip to step 3. Click the Additional Per Account Charges tab. Enter a Charge Name, such as Annual Club Fee. Click Select to pick a Chart of Account. Click Select to the right of desired CoA. Enter Amount to Charge/Discount. To give all accounts a discount, enter something like -50. Click --Select-- drop down and select Charge Monthly to charge the fee/discount every single month, or Charge Annually on these month(s): and pick the desired months. Similar to the last feature, fees or discounts here are generated at the interval specified for each active member in an account that meets the Billing Group selection criteria. Can apply to all or specific Billing Groups. Members must be active and not in a free billing group. Just like additional per account charges, remember that if you charge a certain per account fee in Registration, do NOT charge it here as well, and vice versa. If you want to charge members in all Billing Groups but one or two, you must add all the groups you want to charge one at a time. Here is how to add a per member charge. If you just completed the Additional Per Account Charges, skip to step 3. 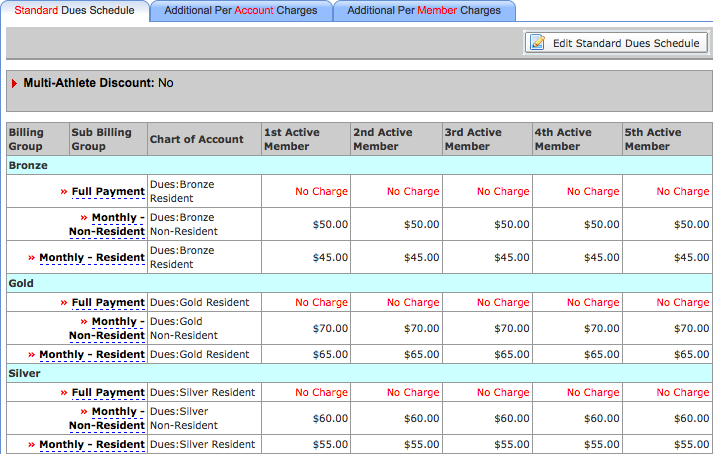 Click the Additional Per Member Charges tab. If the charge applies to all Billing Groups, leave the “This charge applies to Group” drop-down set to --ALL Groups--; otherwise select the Billing Group you want the fee to apply to. Enter Amount to Charge/Discount. To give members a discount, enter something like -50. We are almost finished! Now it’s time to assign members to the Groups you defined.